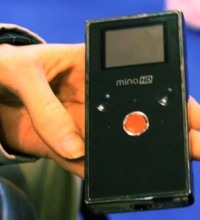 One of the first products that I got to check out at The Gadget Show Live last week was the Mino HD from Flip. The updated version of their popular ‘point and shoot’ camcorder – a product category that the company practically invented – supports 720p HD video (H.264) and has 4GB of on-board memory (non-expandable), which provides enough storage to shoot about an hour’s worth of footage. The really neat feature of the Mino, however, is the slide-out USB connector, together with pre-installed software (Mac/Windows) that enables basic editing of any captured video and upload to YouTube, MySpace, and a number of other video sharing sites. In terms of picture quality, I didn’t get a chance to compare the Mino HD with other similar or more expensive camcorders – a review unit should arrive this week – but what I will say is that Flip’s latest device is incredibly light weight and small despite all that High Def goodness.